Fried oyster omelette, or better known as ‘orh luak’ amongst Singaporeans, is a savoury dish that you can easily find in hawker centres all over Singapore. Crisp on the outside and slightly sticky and starchy inside, who would have thought that this version that most of us have had for years isn’t actually the traditional version that was served back in the olden days? Believe it or not, the traditional version of the amazing egg and oyster combination is a wetter, gooier rendition known as Tang Shan fried oyster. Needless to say, finding a stall that still serves this traditional orh luak is like searching for a needle in a haystack. Luckily for us, Hock Kee Fried Oyster at Serangoon Garden Market & Food Centre still serves rich and creamy oysters in the traditional wet version and here is what you need to know about this dish. Situated in Serangoon Gardens Market & Food Centre, Hock Kee Fried Oyster is an unassuming stall tucked away in the corner. Mr Simon Poh—the owner of Hock Kee—has been frying these delicacies ever since he was young. Today, he and his wife have been running this stall for 11 years now and here you can expect a selective range of traditionally-fried grub that is simply irresistible. The main distinction between the traditional Tang Shan fried oyster (S$5/8/10) and the usual fried oyster omelette (S$5/8/10) lies in the potato starch content—the former uses a much larger amount of potato starch while the latter uses just a third of that amount. The result is a consistency that is wetter, stickier and gooier—the relatively softer version of this savoury dish is most popular amongst the older generations as it glides down your throats with ease rather than having to chew. Mr Poh explains that the elderly generally face a problem with chewing solid foods, and as such, the Tang Shan fried oyster allows them to fully savour the taste with no difficulties at all. Seemingly more popular amongst the older generations, the Tang Shan fried oyster is a unique version of this delicacy we reckon youngsters ought to try. It is definitely different from the usual and to some, the texture may seem somewhat dubious but we fell in love with this right from the very first spoonful. What more can we say? The Tang Shan Fried Oyster is definitely in a league of its own. Besides the Tang Shan fried oyster, Hock Kee also dishes out the usual crispy fried oyster to suit the masses. Fried till the edges are slightly crisp and golden brown, we loved how each mouthful we took were brimming with wok hei. Oyster lovers, you surely are in for a treat. A generous helping of unbelievably plump and fresh oysters are fried together with the eggs, bringing out a marriage of flavours especially after adding their homemade chilli sauce at the side. 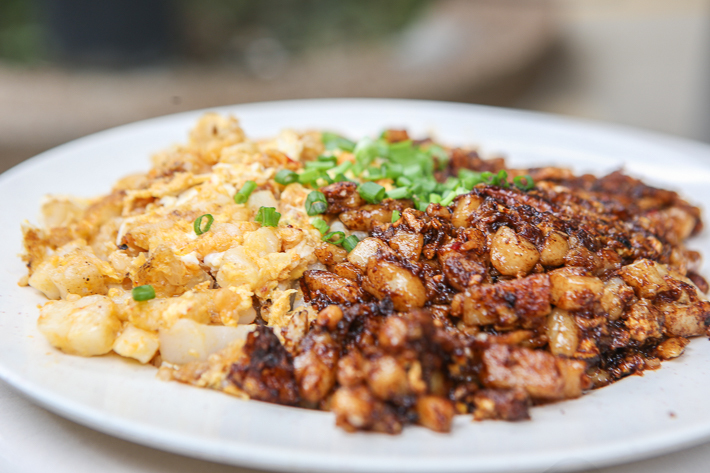 Besides fried oysters omelette, make sure to order up a serving of their fried carrot cake too. Handmade from scratch and shaped right there and then, you can expect radish cake pieces that are nothing short of soft and fluffy. Should you find yourself in a bit of pickle like we did, you may opt for a plate of half-white and half-black carrot cake (S$5) to get the best of both worlds. The white carrot cake came stir-fried with a generous amount of eggs that served to accentuate the soft texture of the slabs of radish, while the black carrot cake was fried with a dark sauce that resulted in a slightly sweeter, caramelised taste. Should you find yourself in the area, make sure to pop by and try out their amazing renditions of the fried oyster omelette as well as their handmade carrot cakes!